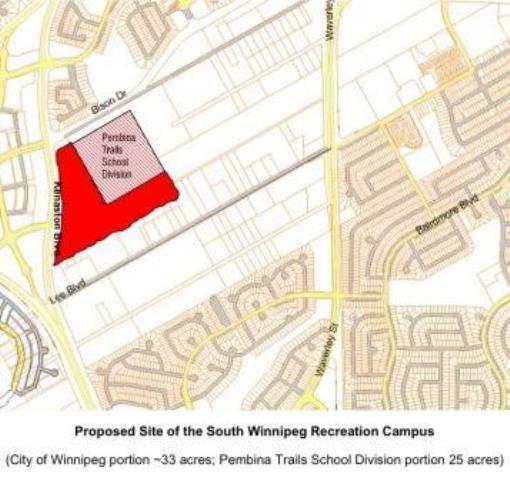 A South Winnipeg Recreation Campus Project Charter has been developed with key stakeholder groups: Pembina Trails School Division, YM-YWCA, South Winnipeg Action Team, Pembina Active Living (55+), community representatives and City of Winnipeg Departments. These organizations have developed governance principals, project structure and responsibilities related to the development of the recreation campus. The Project Charter was completed in November, 2016 and signed by all partners – see additional details. This is a huge accomplishment! Manitoba Housing and Renewal Corporation completed the sale of their land in ‘Area B’ to Qualico Developments. I look forward to working with Qualico as a stakeholder in the development of the Area Structure Plan and as a stakeholder in the South Winnipeg Recreation Campus. A ‘request for proposals’ was issued in November, 2016, seeking a consulting firm to develop an Area Structure Plan for Waverley West ‘Area B’. The development of this plan will occur concurrently with the planning of a new recreation campus. The Area Structure Plan will define the broad servicing requirements for this region, in order to bring in a full range of municipal services. This will include roads, land use, water, sewer, and land drainage. The consulting firm which is selected to develop the Area Structure Plan will undertake a comprehensive planning process and include opportunities for input from land owners and stakeholders. These consultations will be advertised through local media, and will be posted on our website. I expect the consulting firm to be selected by mid-January and work will begin. The ‘request for proposals’ (RFP) has now been posted to the City of Winnipeg’s website, with a closing date of February 7, 2017. The RFP is seeking a design team to develop a high level business plan, conceptual design and Class D cost estimate for the recreation campus. The consulting firm / design team will work with the firm who is developing the Area Structure Plan, City of Winnipeg Departments, and stakeholders to develop a visual concept of the campus. Three consultations will be held with the public to gather input. These consultations will be advertised through local media, and will be posted on our website. I expect the consulting firm will be announced early February, 2017 and it will take approximately 6 months to meet with the community and prepare a conceptual plan with a price tag! Once a price tag is determined, the next phase will be to seek funding. This is a desperately needed facility, and it is a top priority of mine to keep it moving forward! For additional information, visit Ward Priorities: South Winnipeg Recreation Campus. My thanks to Metro News for reporting on this story. Janice Lukes, is the area councillor for Waverley West, a massive suburb on the outskirts of the city. She hopes the neighbourhood will one day house a new regional recreational hub, complete with a community centre, sports fields, transit service, and library – and that’s just the beginning. Dubbed the South Winnipeg recreation campus, the project is slated for a 33-acre parcel of land along Kenaston Boulevard, adjacent to the future site of two new schools. Recently, the city began its search for a consultant to come up with a conceptual design for the first-of-its-kind project. “There’s nothing like this in the city. Nothing like this,” Lukes said in a recent interview. A report from 2015 estimated that, by 2020, the population of the seven neighbourhoods of Waverley West would swell to 40,000 – nearly the size of Brandon, Man. “Everyone is very aware of the shortage of recreation facilities out here. Everyone out here is paying high taxes,” Lukes said. The city has budgeted $350,000 for the study and $3.8 million for land acquisition. For six months, the consultant will have to assess how the land could be serviced for water and sewer, and offer transportation options from transit park-and-rides, bus stations and parking. They will also have to analyze the feasibility of building a wide range of indoor and outdoor amenities, from a senior’s centre and multiple arenas, to a swimming pool and spaces for a community kitchen and daycare. Lukes said residents will have the chance to say what they want to see on the site in three open houses, with the first one anticipated for spring. “It’s not often you get a big piece of land, a parcel of land, a clean slate to come up with something really innovative and creative,” she said. As for the cost, the consultant will return with an estimate. That’s when Lukes says she will begin shopping the project around to the province and feds, as well as to organizations like the YMCA-YWCA Winnipeg, for funding and partnerships. “Every single opportunity’s on the table,” she said, adding there will be capital campaign launched. Because the intent is to design the campus for its facilities to be shared between the city, schools and different community groups, Lukes said taxpayers dollars will be saved in the long-run. Coun. John Orlikow, chairman of the planning, property and development committee, said the project would need further council approvals to proceed. “The reason why we need to have recreational facilities is due to the growth of Winnipeg in these areas,” Orlikow said.